Please note Ardell Elegant Eyes STYLISH Lashes has been discontinued and is no longer available. 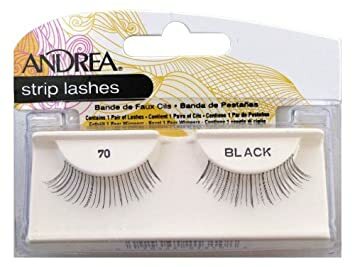 Ardell Elegant Eyes Stylish Lashes (Metallic Accent) have a beautiful criss-cross design with subtle metallic accents. *Bonus: A small tube of adhesive (0.2 fl oz) is INCLUDED with each pair. The first thing you always want to do before applying any false lash (Ardell Elegant Eyes Lashes or not) is to make sure they fit your eye! Before putting glue on, lay the false eyelashes along your lash line, making sure not to position it too close to the inner corner. If the outer corner is extending past your eye, trim it off, remembering to always trim from the outer corner. Tip: Always round out the cut ends. Otherwise, you’ll be left with a very sharp corner that will stab you every time you blink. Ouch! If you want to curl your false lashes, do it BEFORE applying them, and curl from back (the band) instead of approaching from the front (tips) as you normally would. You’ll find it a lot easier and quicker to do this vs. the traditional way. For those looking for a lush, glam on look, we recommend wearing a base lash (any dense, regular strip lash) with rhinestone or glitter lashes for added volume.. These also act as a shelf to prevent your rhinestone lashes from drooping, and the extra volume makes your eyes look more open. It helps to apply the false lashes close to or on your crease but the lash line. Rhinestone lashes and glitter lashes have a much thicker lash band than human hair lashes due to all the embellishments on them. Instead of applying lashes on your lash line, place them closer to your crease and away from the base lash you have on. This helps take significant weight off your lids and makes your eyes look much more open. You won’t believe how much lighter they’ll feel. Please click here for tips & trick on lash application.